"Beauty IS a Beast" is the story of Princess Beauty who is beautiful on the outside but ugly on the inside. Her fairy godmother decides to teach her a lesson by turning Beauty inside out. Audiences of all ages will enjoy this play with an important message... that true beauty comes from the heart. 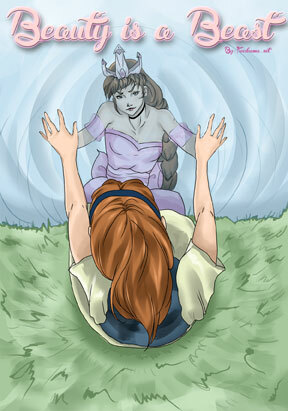 FAIRY: Now how is this story supposed to start. Let's see, Oh, yes. Once upon a time there was a princess named Beauty who was lovelier than anyone else in the entire kingdom. But wait, that's not really when the story started. It really started long ago, in a land far, far away, when Beauty was just a baby. Perhaps I should start by saying twice upon a time. Anyway, There was a royal family, the royal family of Callentine who had brought peace to their kingdom and led everyone out of the Dark Ages, by inventing the light bulb. Just kidding. They were kind and fair rulers who did what was best for the people. As a reward for their good deeds, I decided to make their newborn daughter the most beautiful person in the world. But as you will soon see, making Beauty that way was a big mistake. SARAH: Isn't she the most beautiful thing you have ever seen? SARAH: Her parents must have been truly good to receive such a treasure. PRINCESS: (Angry) What are you two staring at? PRINCESS: (Mocks her) "You were just" what? Staring? Gawking? Why don't you go somewhere and mind your own business? PRINCESS: Yeah, well forgive this. (She throws stones at them) Ha! Got them. (Laughs) That'll teach them. TUTOR: (He comes from castle) Must you treat the peasants that way? PRINCESS: (Pulls his long beard) I must! TUTOR: Can't you behave like a lady? TUTOR: Quit acting like such a beast! PRINCESS: Don't call me names or I'll have Daddy chop off your head like he did to the rest of my tutors. TUTOR: I meant it in the kindest way. (She smiles at his change in tone. She throws another stone at a passing peasant) I'm just worried about you. You don't seem to care for anyone or anything. Someday you'll insult the wrong person and you'll be sorry. PRINCESS: No, it's them who will be sorry. Guards! (GUARDS appear and she points to TUTOR) Take him away. TUTOR: What? What did I do? SCRIBE: (Nervously struggling to hold on to numerous scrolls in his arms) Yes, Princess? PRINCESS: (Knocks all the scrolls out of his arms) Read me my schedule. PRINCESS: Enough! I want to have a party instead. SCRIBE: But of course, I'll go arrange it immediately. PRINCESS: Good scribe. (Pats him on the head) You always keep your head about you. HONOR: (ENTERS) Hello, sister. How are you this fair day? PRINCESS: Are you really that nice or are you just pretending? HONOR: What ever do you mean good sister? PRINCESS: You're always so sweet. Don't you ever get sick of being sweet? HONOR: (Laughs) Oh, sister, you always speak in such strange riddles. You always make me laugh. PRINCESS: And you always make me sick. HONOR: Where is your fair scribe off to? PRINCESS: He is preparing a party. HONOR: I already had a party planned. PRINCESS: You? You never have parties. You're not the popular one. HONOR: I know. I thought it was a silly idea too, but father insisted. PRINCESS: Out with it, girl! HONOR: Prince Andres of Acrime. PRINCESS: Never heard of him. HONOR: He is soon to be the king of Acrime. PRINCESS: Acrime? Where the devil is that? HONOR: Sister? Did you not learn your geography lessons? PRINCESS: Who cares about stupid geography? HONOR: Well, Acrime is the large kingdom East of here. Daddy says the kingdom is larger than ours. PRINCESS: Larger than ours?! Impossible. PRINCESS: So why are you having a party for this prince? Oh, I know! The party is for me! So I can meet Andres. And I spoiled the surprise. How horrible of me. Well, I will be sufficiently surprised when you introduce me. PRINCESS: I know you don't want me to lie but it isn't really lying. We wouldn't want to disappoint father. PRINCESS: I must hurry and get on my most lovely dress. I want to look my best for our guest. Not that I don't always look my best. I know one can't improve on perfect beauty, but I shall try. GO TO PART 2 on the Freedrama Blog. *Freedrama scripts by D. M. and Shiela Larson are FREE to use in a classroom, audition, competition, or workshop.